According to legend, famed 19th century German actor, Ludwig Devrient walked into Lutter and Wegner in Berlin, Germany and demanded, “Give me a cup of sekt (sack), rogue!” And with that caddish statement, new slang was born. The sparkling white wine (or German champagne) previously known as Schaumwein would henceforth be called Sekt. It still is today. I didn’t know this when I walked along the Charlottenstrasse one evening. I was trying to find a hot, new Asian restaurant nearby. I had a serious craving for a bowl of noodles until I passed by a cozy, wood-paneled restaurant on the corner. The small, wood plaque identified it as Lutter and Wegner. But that one peek inside the window stopped me in my tracks. Curious George had beckoned from the bar (or, at least, a statue of him). How could I resist and just walk on by? As it turns out, Curious George lured me into a fairly famous spot. Lutter and Wegner has been making wine for over 100 years. 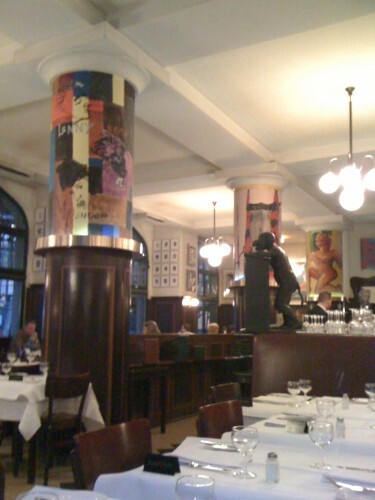 And serving traditional German fare at this Charlottenstrasse location for nearly as long. (There is also an adjacent Weinstube, or wine bar). But again, I didn’t know this until I opened the menu. And once I read that, I was fairly skeptical. After all, how many restaurants claim fame on the first pages of the menu? The food convinced me. Sophisticated, complex dishes like my creamed veal goulash served with spaetzle and cheese curd souffle in sour cherry punch had me in thrall. The souffle was likely one of the best I’ve ever had. And the lovely Lutter & Wegner brand white wine recommended by the staff was just as good. Dry and subtle, with little hints of yellow flower fields, honey and sunshine, every sip satisfied. Once I returned my hotel later that evening, I googled Lutter and Wegner and learned a lot more about them. Mostly, that it’s considered one of the best places to get a schnitzel in Berlin. Oops – I guess I missed the boat on that one. So how could I not return the next night with my husband and son to give it a try? It seemed to be a family favorite with Berlin locals, too. But I ordered the award-winning Sauerbraten instead (which, incidentally, deserves every ribbon it gets). I suppose a return trip is in order.